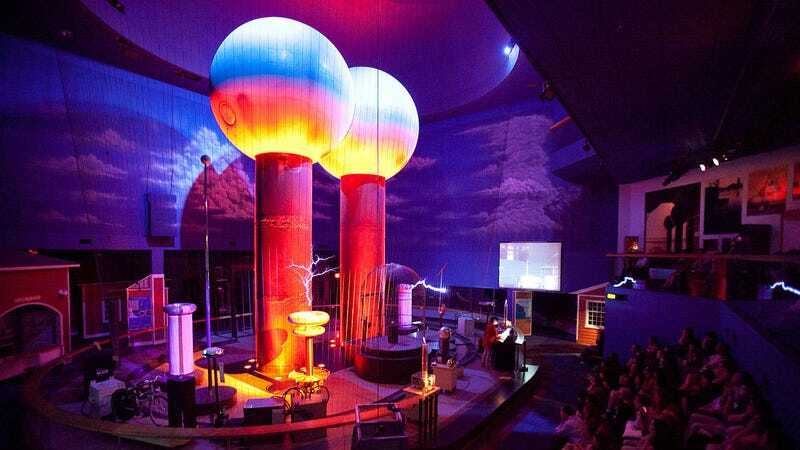 Visitors to the Museum of Science in Boston are always in for a hair-raising treat when they enter the facility's Theater of Electricity. This small amphitheater is actually the permanent home of the largest air-insulated Van de Graaff generator on the planet—a pair of 40-foot high spheres crackling with up to 5,000,000 volts of electricity. A Van de Graaff generator is a mechanical electrostatic generator. Using the same principle as rubbing stocking feet over carpet to generate a small charge of static electricity to be unleashed on unsuspecting siblings, a VDG generator employs a moving belt of material running up the length of a stand into a hollow metal sphere to generate a charge at the positive electrode (at the top of the pulley) while negative charge flows into a separate ground electrode at the bottom. This creates a large electrical potential difference between the two electrodes, enough to power MIT's particle accelerator—which was being used for pioneering fundamental physics, nuclear medicine, and radiography research at the time. The generator American physicist Robert J. Van de Graaff designed and built in 1929 with the assistance of colleague Nicholas Burke employed a simple silk scarf from the local five-and-dime. A subsequent one built in 1931, for all of $90, used 60 cm spheres and could produce up to 1 MV, no small feat at the time. However, these were small scale prototypes. The mammoth generator he built in 1933 remains the largest of its kind ever constructed. At MIT's Round Hill facility, the 40-foot tall VDG generator consists of a pair of conjoined, hollow 15-foot aluminum spheres—each outfitted with felt grommets and dehumidifiers to maintain peak conductivity conditions—mounted atop a 22-foot textolite column and powered by a 4-foot-wide, 3600 RPM paper-insulated belt riding atop steel pulleys. This setup was capable of generating up to 5,000,000 volts, though 2 million volts is the average.